Before I begin waxing poetic about soup, a story. Every year at Thanksgiving, I roast garlic. Usually for my famous Roasted Garlic Mashed Potatoes. This year, for a too-greasy Roasted Garlic Manchego Gratin from Food & WIne. The process is always the same — place garlic cloves in a shallow baking dish, drown them in olive oil, cover with foil, spill oil in the hot oven, smell smoke, then run around with paper towels trying to mop up burning, smoking oil from the bottom of the oven while trying not to burn myself or set anything on fire. Sounds fun no? It’s awesome. Since this happens every year in my mom’s usually-clean oven, she bought me a teeny, tiny Le Creuset dutch oven that’s just the right size for roasting garlic. And as a bonus, it comes with a snug-fitting top so I won’t spill hot oil all over the place. Sometimes traditions must come to an end. This cute little pot is also useful for blog photos. See how pretty my soup looks? Moving on, this soup is thick and hearty, really flavorful, super simple. Start with a couple of very spicy sausages, add butternut squash, pearled farro, chicken stock and curry powder…maybe a few handfuls of baby spinach for color, and you’ve got a delicious little lunch that’s satisfying and warm on a cold day. It also sets off my new Le Creuset mini-pot nicely! Set a large pot over medium-high heat. Once it’s hot, add the olive oil and brown the sausages. When browned, add the butternut squash, farro, chicken stock, pepper and curry powder. Let it come to a rapid simmer, cover and reduce heat to medium-low. 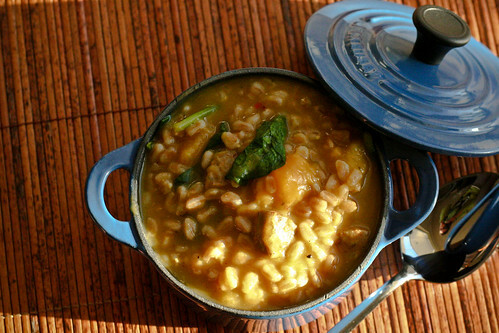 Cook for 30 minutes, or until the farro is tender. Use your spoon or a potato masher to mash up the chunks of squash. Stir in the lemon juice and spinach and add the extra cup of chicken stock if the farro has soaked up too much liquid. Taste and add salt if needed. Serve and drizzle with olive oil or sprinkle with freshly grated Parmesan cheese if you’d like. I don’t know which is more lovely, the soup or the pot. I have one in the same color and my if they aren’t photogenic! I am always looking for healthy dishes and new things to do with soups. This looks like a real winner! Thanks for sharing it! It’s starting to feel like Fall outside! I’m going to make this, this weekend. I think my BF will love it. Thanks!